Derinkuyu Underground City is an ancient multi-level underground city in the Derinkuyu district in Nevsehir Province, Turkey. 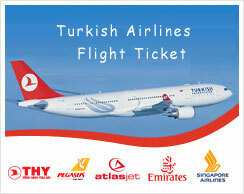 It is on the road between Nevsehir and Nigde, at a distance of 29 km from Nevsehir. With its eleven floors extending to a depth of approximately 85 m, it was large enough to shelter thousands of people together with their livestock and food stores. It is the largest excavated underground city in Turkey and is part of a network of several underground complexes found across Cappadocia. It was opened to visitors in 1969 and to date, only ten percent of the underground city is accessible to tourists. The underground city at Derinkuyu could be closed from the inside with large stone doors. The complex has a total 11 floors, though many floors have not been excavated. Each floor could be closed off separately. The city could accommodate between 3,000 and 50,000 people and had all the usual amenities found in other underground complexes across Cappadocia, such as wine and oil presses, stables, cellars, storage rooms, refectories, and chapels. Unique to the Derinkuyu complex and located on the second floor is a spacious room with a barrel vaulted ceiling. It has been reported that this room was used as a religious school and the rooms to the left were studies. Between the third and fourth levels is a vertical staircase. This passage way leads to a cruciform church on the lowest level. The large 55 m ventilation shaft appears to have been used as a well. The shaft also provided water to both the villagers above and, if the outside world was not accessible, to those in hiding. First built in the soft volcanic rock of the Cappadocia region by the Phrygians in the 8th-7th centuries B.C according to the Turkish Department of Culture, the underground city at Derinkuyu was enlarged in the Byzantine era. The city was connected with other underground cities through miles of tunnels. One of the heavy stone doors. They have a height of 1-1,5 m, 30-50 cm in width and weigh 200-500 kg. The hole in the centre can be used to open or close the millstone, or to see who is outside. The underground city of Derinkuyu was the hiding place for the first Christians who were escaping from the persecution of the Roman empire. Everything discovered in these underground settlements belongs to the Middle Byzantine Period, between the 5th and the 10th centuries A.D. The number of underground settlements, generally used for taking refuge and for religious purposes, increased during this era. The Christian communities in the region took refuge, closing the millstone doors, when they were subjected to Arab raids which started in the 7th century. The raiders, aware of the dangers awaiting them inside, tried to make the local people leave their shelters by poisoning their wells. 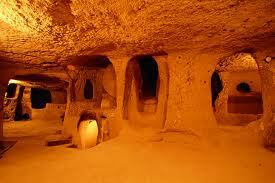 Nevsehir Province has several other historical underground cities. The cities and structures are carved out of unique geological formations. They were used by Christians as hiding places during times of persecution and raids. The locations are now archaeological tourist attractions. They remain generally unoccupied. In excess of 200 underground cities containing a minimum of two levels have been discovered in the area between Kayseri and Nevsehir. Some 40 of those contain a minimum of three levels or more. The troglodyte cities at Kaymakli and Derinkuyu, are two of the best examples of habitable underground structures.